Ashwin SanghiAshwin Sanghi, a Bangor University PhD Creative Writing student- who is already a publishing phenomenon in his own right in his native India, is to co-author a novel with a writer currently described as the world’s most popular crime fiction writer: author James Patterson. James Patterson has developed a highly popular series of novels in which he works with local authors to co-write the globally bestselling ‘Private’ series of crime novels. The premise of the series is centred around ‘Private’ a global detective agency with branches in the world’s major cities. By collaborating with popular authors from different countries and cultures, James Patterson is able to portray and reflect the real ‘feel’ of major cities, countries and cultures. 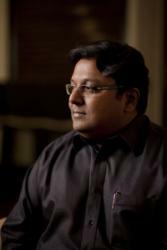 For ‘Private India’, Ashwin Sanghi’s publishers, Random House India and Cornerstone, a division of Random House UK, have announced a new collaboration between James Patterson and Ashwin Sanghi. Susan Sandon, managing director for Cornerstone, Random House UK acquired the rights to publish Private India across the Random House Group territories. Teaming the world's biggest selling thriller writer with India's bestselling author of The Krishna Key and Chanakya’s Chant, Private India (working title) will be released in early 2014. It will combine the trademark suspense and fast-moving plots of Patterson's writing with the exhaustive research and gripping plots of Sanghi's thrillers. Publication of Private India will follow a year of major promotional activity for James Patterson in India, starting with the exclusive publication of a paperback format of Alex Cross, Run in February 2013, ahead of the hardback edition in the rest of the world. James Patterson says: "Writing my Private series of books has given me the opportunity to work with local authors on thrillers set all over the world. With its vibrant and chaotic cities, and rich history and heritage there could be no better place to set Private's next adventure than India. And in Ashwin Sanghi, with his wide historical knowledge and his love of a fast-paced plot, there could be no better writing partner. I look forward to working with him to create a unique, Indian-based adventure." Ashwin Sanghi says: "In the past three years, James Patterson has sold more books than any other author across the globe. It is my privilege and honour to be co-writing an India-specific thriller along with the master storyteller himself. I also see it as an opportunity for me to hone my skills in a slightly different but immensely exciting genre. I am quite certain that the fusion of ideas from East and West will result in a gripping and engaging read." Dr Nathan Abrams, of Bangor University’s School of Creative Studies and Media and Ashwin Sanghi’s PhD supervisor commented: "I am delighted with this news. Ashwin continues to go from strength to strength, from a self-published and self-taught author to a collaboration with one of the world's best-selling and best-known authors. I look forward to the results with great anticipation."